Today Michelle and I traveled south on Route 102 along the west side of Sommes Sound to visit the towns of Southwest Harbor and Tremont. 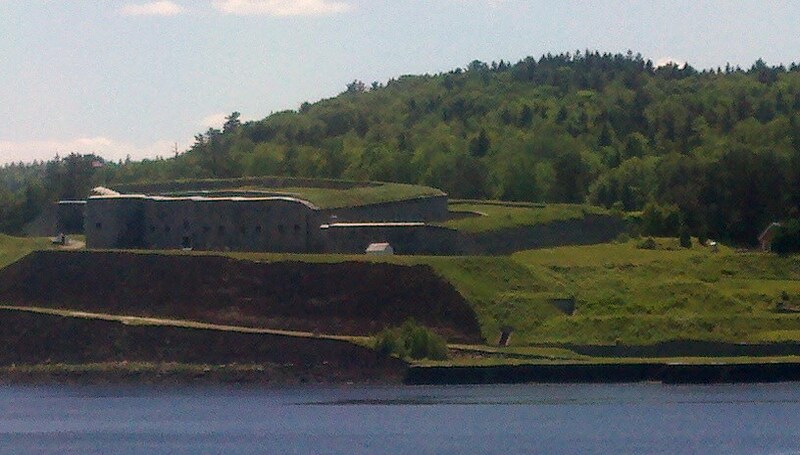 Southwest Harbor is a town located on Mount Desert Island, with a population under 2,000. It has one school, Pemetic Elementary School. 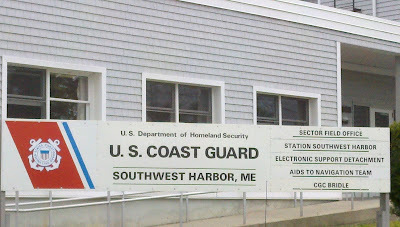 Southwest Harbor has a Coast Guard Station. 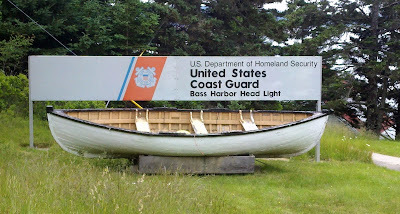 Everytime I see a Coast Guard Station, I recall that the Coast Guard doesn't have a bad duty station. 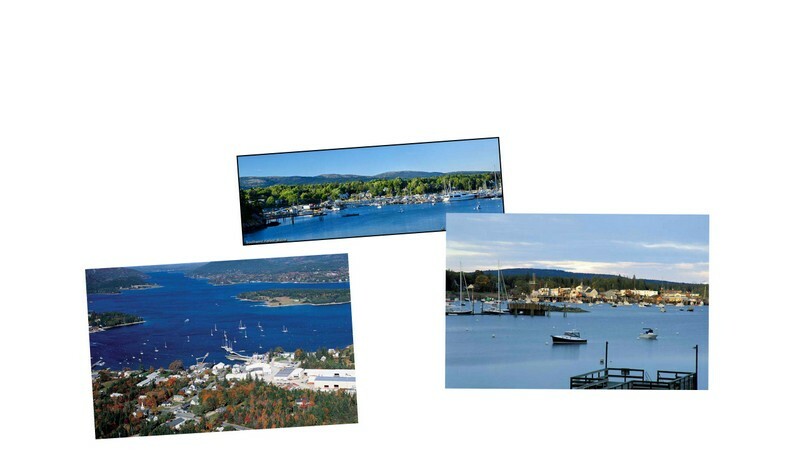 Hinckley Yachts maintains its headquarters, design, construction, and repair facilities in Southwest Harbor. Hinckley Yachts, founded in 1928, is a manufacturer of luxury sailing yachts and jet-powered picnic boats. In an effort to keep its reputation of fully handcrafted boats, Hinckley relies on a manual assembly line process to create its yachts, meaning widespread automation is nearly impossible. Due to the custom format of the yachts, Hinckley does not go through model years, rather it attempts to make “two major changes per year” to its line of vessels. The Hinckley Company (the mother company of Hinckley Yachts) also provides such services as yacht service, yacht brokerage, charters, and boat insurance. 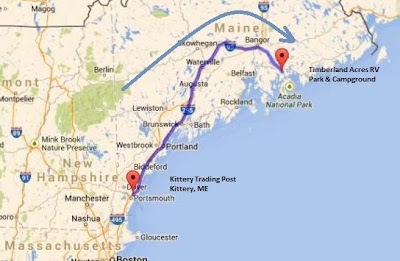 Hinckley currently conducts operations in seven locations across the North East and South East regions of the United States. Hinkley builds both motor yachts and sailing yachts. 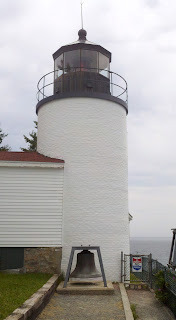 We motored along Rt 102 to the village of Tremont and spent a little time at Bass Harbor Head Light Station. Bass Harbor Head Light is a lighthouse located within Acadia National Park on the southeast corner of Mount Desert Island, Maine, marking the entrance to Bass Harbor and Blue Hill Bay. 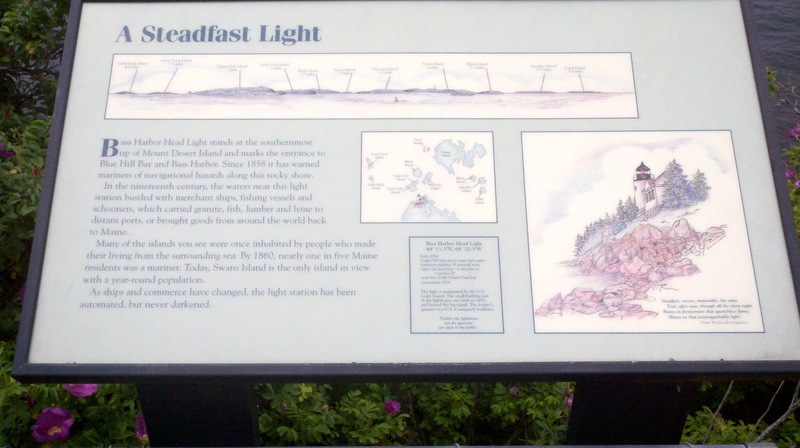 This plaque gives information on the bay and the light. The lighthouse was added to the National Register of Historic Places as Bass Harbor Head Light Station on January 21, 1988. Today, the house is a private residence for a local Coast Guard member and his family. Tourists can get close to the bell and light via a concrete path, but most of the grounds remain private. 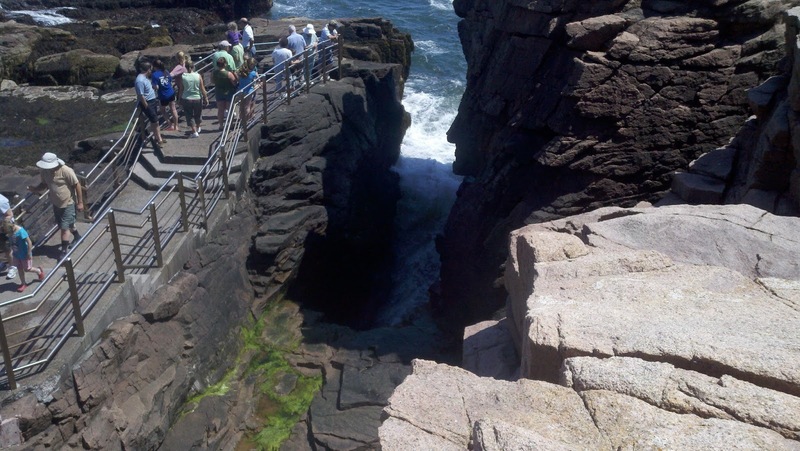 There is a short walk which takes you to a series of wooden steps that lead you down onto the many granite boulders that provide a great view of the harbor side of the lighthouse and the harbor itself. 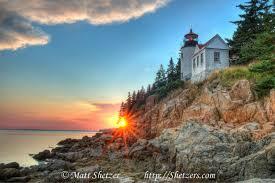 This awesome photograph of Bass Harbor Head Light is by Matt Shetzers. Check out his website for more of his photography and his workshops. By then our stomachs were yelling for lunch. Finding nothing along the road, we continued on to Bar Harbor and sought out someplace on the water. That turned out to be Stewman's Lobster Pound, where we began our serious efforts to over indulge on seafood. 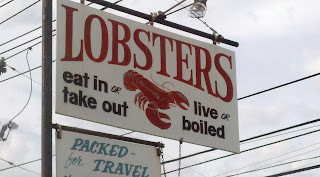 Michelle had a Lobster Roll and I had a bowl of Seafood Bisque. 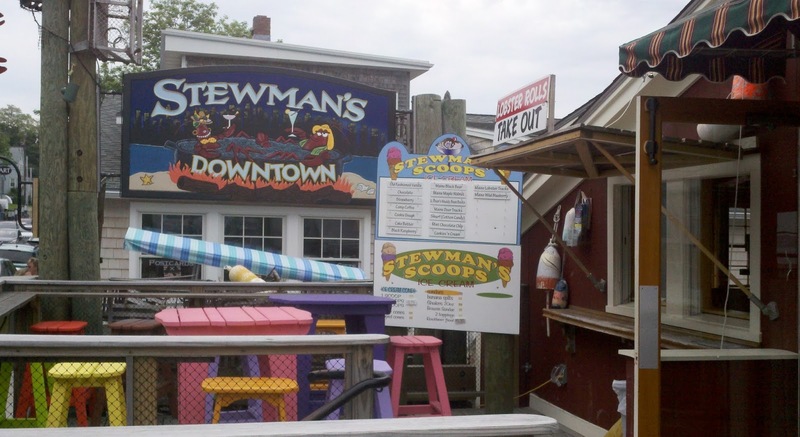 Stewman's Lobster Pounds are the only authentic oceanfront lobster pounds in Bar Harbor, Maine. We spent the afternoon packing the Cougar and joined our caravan buddies for an "Empty the Fridge" dinner to get rid of all the stuff we can't take across the border into Canada. It was a good opportunity to get acquainted with our travelling companions. Here we are. Thirty-seven souls about to take off on a 54 day adventure through the Maritime Provinces of Canada -- New Brunswick, Prince Edward Island, Nova Scotia (both islands), and Newfoundland (but not Labrador). Some in the group are close friends, some are casual acquaintances, some are strangers. I think I can safely say everybody knows someone and nobody knows everyone. In our case, the only people we know well are Carole and Nelson Hommel. Geography lesson. 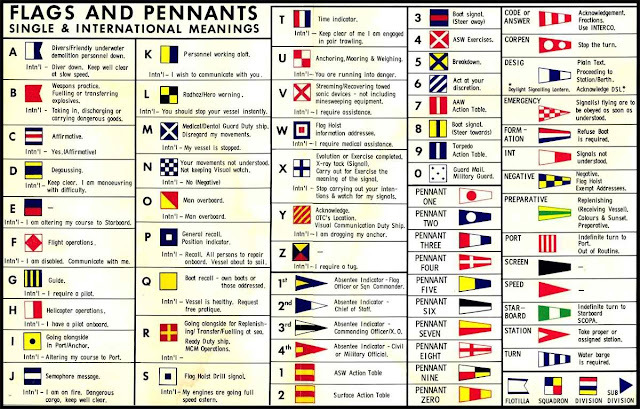 You may not need this but I did and I've been here before. 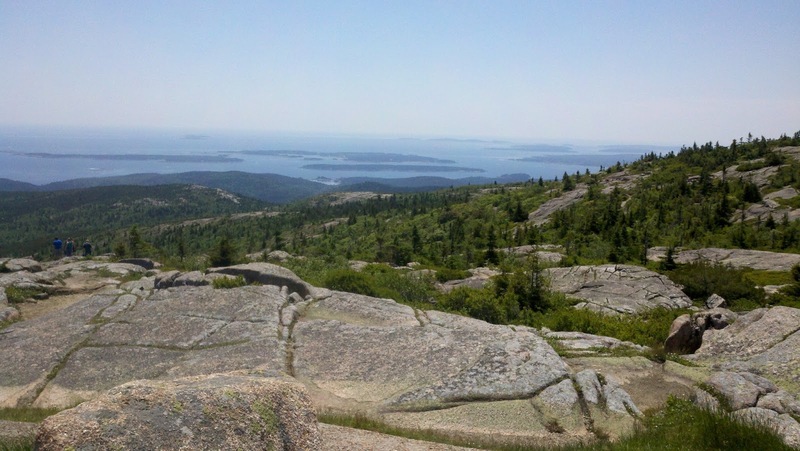 This is my effort to get these often confused words straight: Bar Harbor, Acadia National Park, Mt Desert Island, Trenton, Trenton Bridge, and Cadillac Mountain. Mt Desert Island is a very LARGE island located a very LITTLE distance off the coast of the US at Trenton, ME. 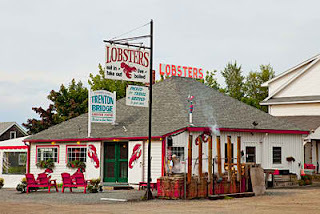 It is connected to the mainland at Trenton, ME by the Trenton Bridge (imagine that). 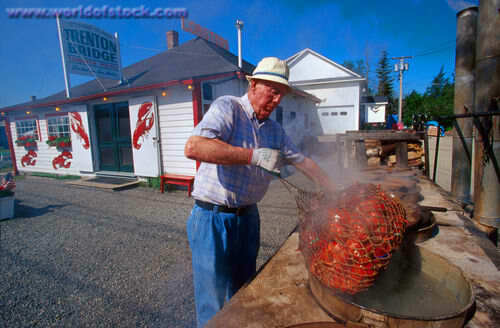 Mt Desert Island is part of the state of Maine. 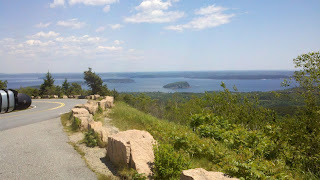 Physically located on Mt Desert Island are the town of Bar Harbor, Acadia National Park, and several small villages. 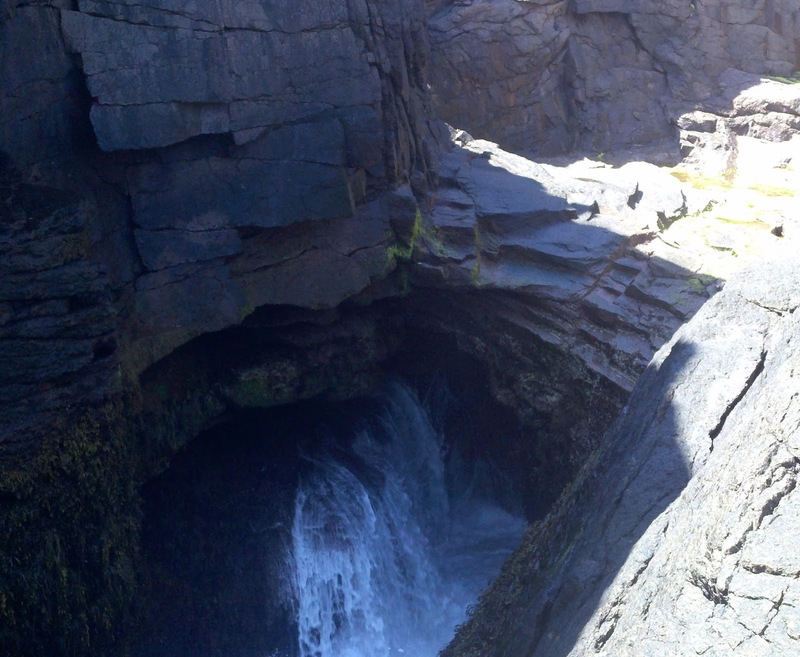 Acadia National Park property occupies nearly half of the island in several disconnected segments plus a scattering of smaller islands, and the Schoodic Peninsula. 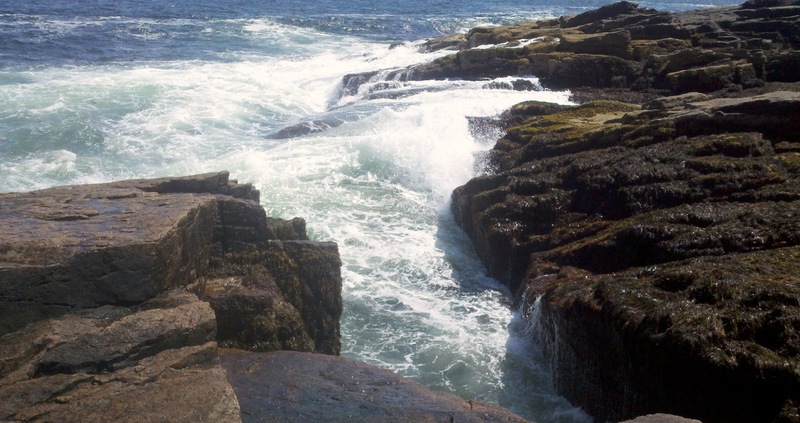 Schoodic Peninsula is the only section of Acadia National Park that is located on the mainland of Maine. 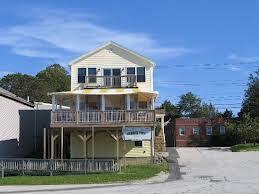 Shared by the towns of Gouldsboro and Winter Harbor, the peninsula is in a more secluded type setting. 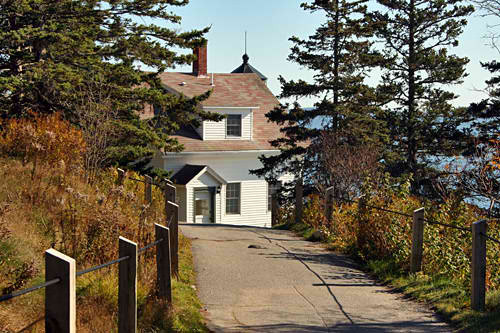 Spectacular panoramic views of Frenchman Bay and Mount Desert Island can be seen from Schoodic Head's 440 foot high point. 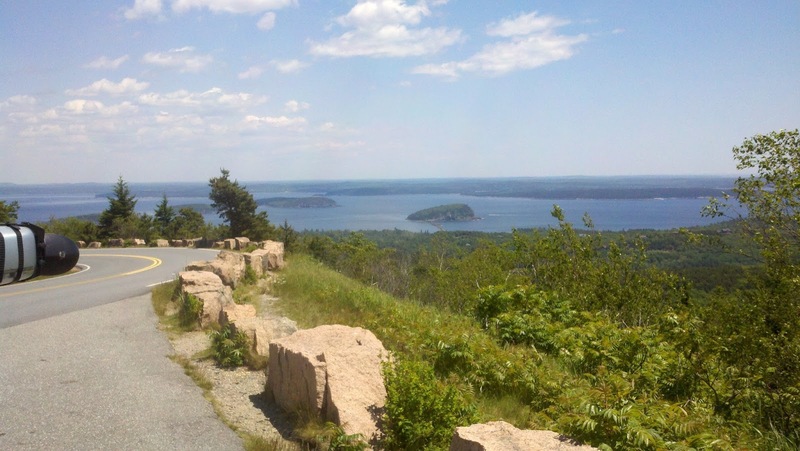 The town of Bar Harbor is not part of Acadia National Park. 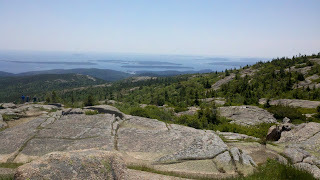 Cadillac Mountain (44.352624,-68.225101) is part of Acadia National Park and is the highest elevation (1,530 ft.) on Mt Desert Island. If you stand on Cadillac Mountain at dawn you will be the first person in the US to see the sunrise. Michelle and I spent the day walking and driving around Mt Desert Island. 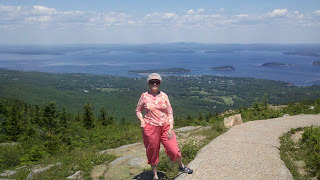 We drove up to the Cadillac Mountain parking lot and spent about an hour taking in the scenery from the "summit". 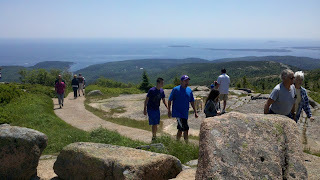 Cadillac Mountain is a famous and well-worn tourist site, so the road and walking paths are paved and well maintained. 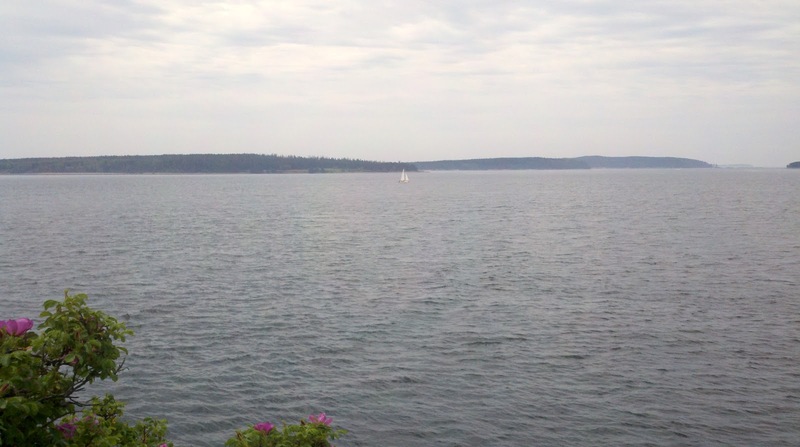 This is definitely not wilderness. The town of Bar Harbor is in the background behind Michelle. 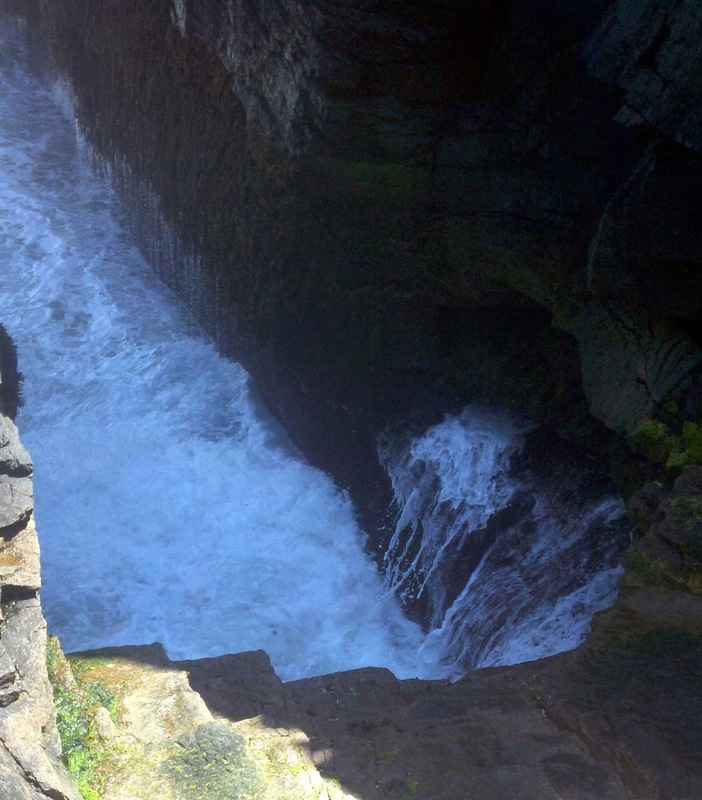 Our next stop on the Park Loop Rd was Thunder Hole. This was impressive to me. My favorite photography subject is "water on rocks". I am always a little bit in awe with the "irresistible force meeting the immovable object" for millions of years past and still working at it. 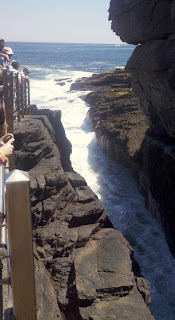 I also love the sound of waves crashing on rocks. 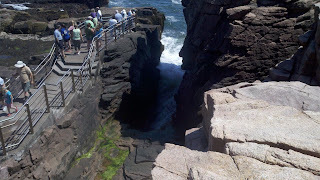 That sound is amplified significantly at Thunder Hole and it changes volume and tone as the tide changes. This evening was spent with friends. George and Gloria Bursey are friends from The Great Outdoors. While wintering in Florida at The Great Outdoors they live on Fawn Trail. 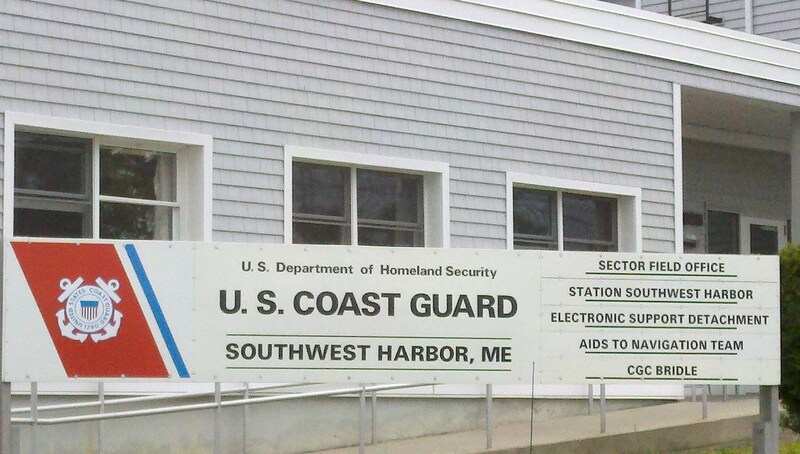 Their primary home is in Trenton, ME. 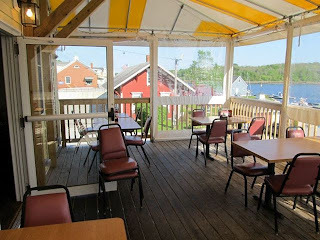 It is a beautiful waterfront property that can be seen from Trenton Bridge as you leave Mt Desert Island heading north. This evening Nelson and Carole Hommel, Ruth and Bernie MacDonald, and Michelle and I took them to dinner at Jasper's Restaurant in Ellsworth. 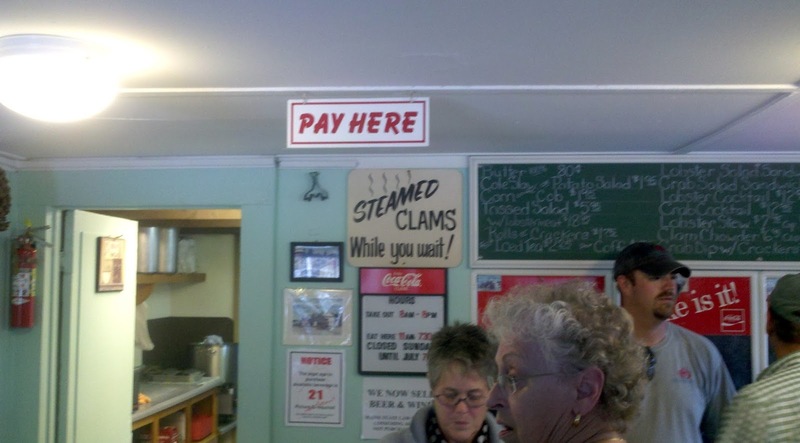 I had the Haddock Special and Michelle had Swordfish. 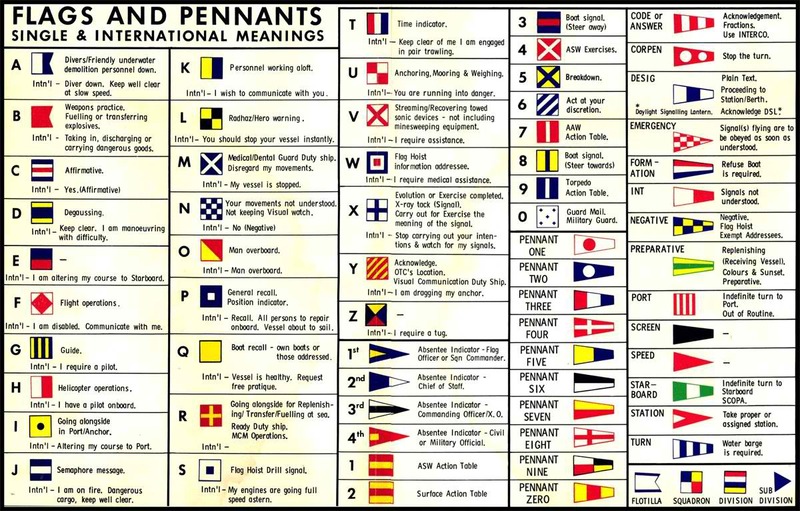 In case you're wondering, the signal flags across the top of the sign spell J-A-S-P-E-R-S. No flag for the apostrophe. Today the weather was beautiful all day so Michelle, Carole and Nelson Hommel, and I went out to explore the small villages of Maine near Bar Harbor and wound up in Bucksport, ME, a town in Hancock County, ME with a population of about 5,000. Bucksport is an historic town across the Penobscot River estuary from Fort Knox and the Penobscot Narrows Bridge. If this really excites you, learn more at wikipedia. 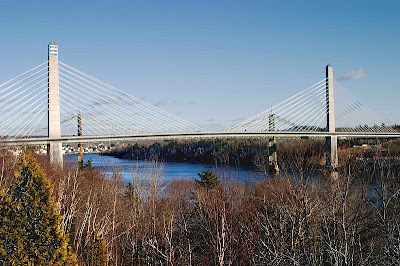 Towering over this little town is The Penobscot Narrows Bridge, a 2,120 feet long cable-stayed bridge over the Penobscot River connecting Verona Island, ME to Prospect, ME. It replaced the Waldo–Hancock Bridge, built in 1931 which you can see in the background of this early photo. 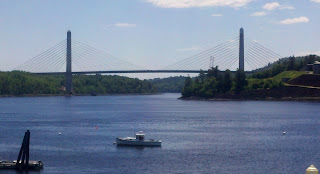 The Penobscot Narrows Bridge is one of three bridges in the US (the others being Zakim Bridge in Boston, Massachusetts, and Veterans' Glass City Skyway in Toledo, Ohio) constructed recently to utilize a cradle system that carries the strands within the stays from bridge deck to bridge deck, as a continuous element, eliminating anchorages in the pylons. Each epoxy-coated steel strand is carried inside the cradle in a one-inch steel tube. Each strand acts independently, allowing for removal, inspection and replacement of individual strands. The cable-stay system was designed with a system that uses pressurized nitrogen gas to defend against corrosion. In June 2007, six reference strands within three stays were replaced with carbon fiber strands – a first in the US. Monitoring on the strands will evaluate this material for future use in bridge designs. 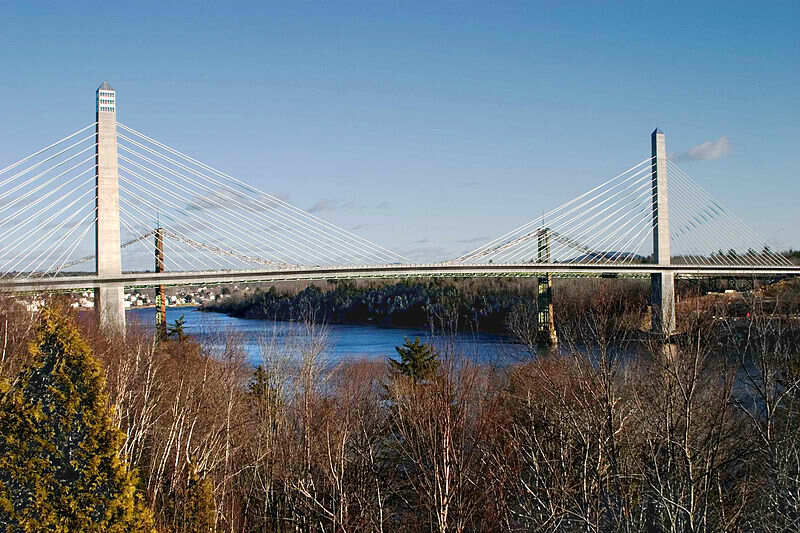 These engineering innovations helped the bridge appear in the December 2006 edition of Popular Science as one of the 100 best innovations of the year. The total project cost was $85 million. The bridge was designed as an emergency replacement for the Waldo–Hancock Bridge. From conception to completion, just 42 months elapsed. A unique project delivery method, referred to as "owner facilitated design/build" partnered Maine DOT with FIGG as the designer and Cianbro/Reed & Reed LLC as the contractor. The elevator system in the tower, which is claimed to be the fastest and tallest elevator in Maine, was installed by Stanley Elevator Company, Inc.
All the Oooing and Ahhhing about this wonderful engineering accomplishment (Nelson and I were impressed, Michelle and Carole not so much) made us hungry. So for lunch we found a local establishment with a nice view and easy parking. 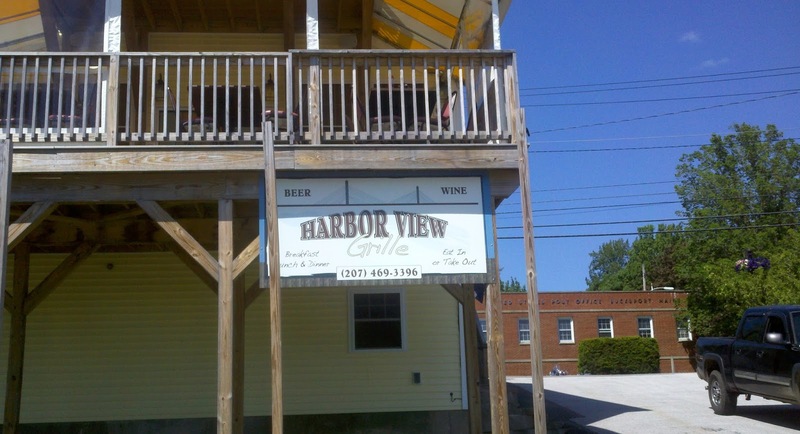 As it turned out The Harbor View Grille had a good menu and served us four delicious lunches. Michelle had a Fishburger and I had a Tunamelt and Seafood Chowder combination. We both finished off with Blueberry Pie with Vanilla Ice Cream after listening to the waitress talk about the woman who comes to the restaurant a couple days a week just to bake pies. It seems I have heard about the baking lady somewhere else. Since she only drives her car to church on Sunday, she must walk to the restaurant to bake pies. Hmmmmm. Is this a preview of meals to come? 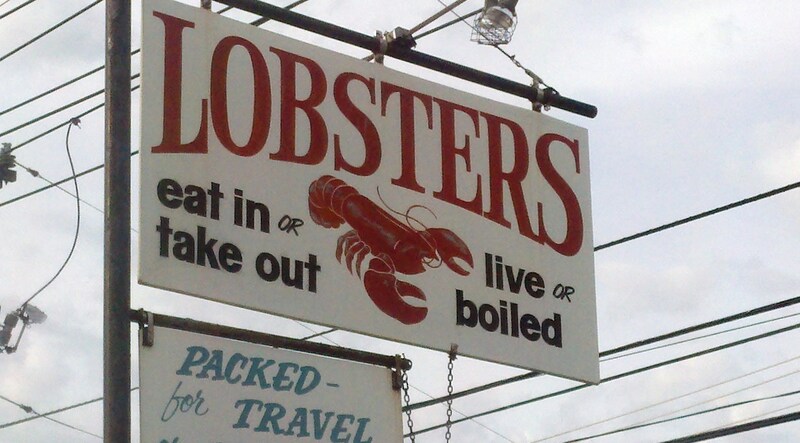 I think we'll skip dinner tonight. 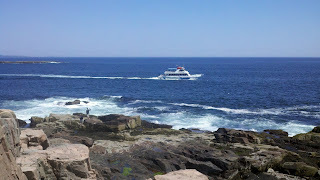 Bar Harbor or is it Baa Habba? Even though today was a short trip, we got off to an early start at 0730 EDT for our 208 mile five hour run from Kittery, ME to Bar Harbor, ME. 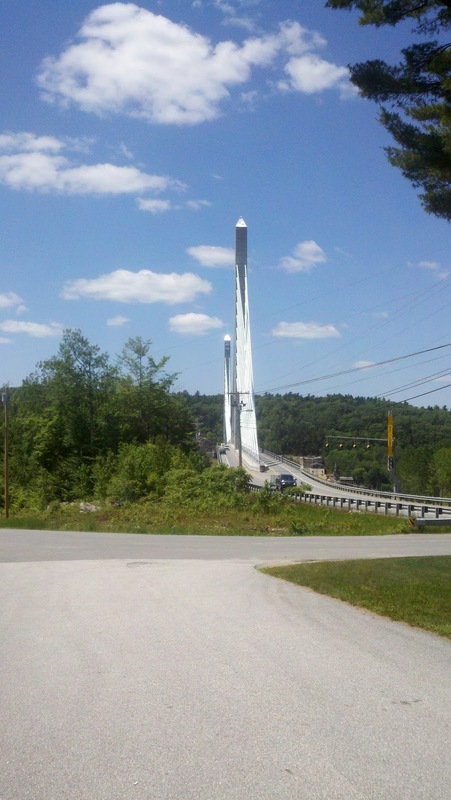 Our one fuel stop was at West Gardiner Service Plaza on the Maine Turnpike. That turned out to be an exceptionally educational fuel stop and I did a separate post on the Truck Stop Electrification (TSE) that I encountered there. 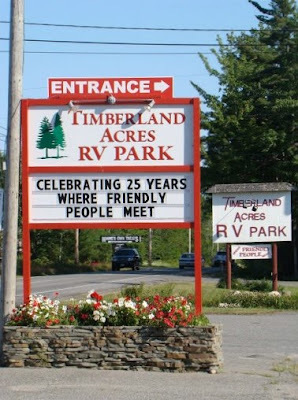 We pulled into Timberland Acres RV Park just after noon. This RV Park is in Trenton, ME on the mainland just across the bridge from Bar Harbor, ME. Several caravan members including Carole and Nelson Hommel have already arrived, so we visited a bit and started meeting caravan members. Conversation started with stories about the road trip from Florida but it didn't take long for it to turn to DINNER. Everyone is ready for some real seafood and this area has an abundance of "Lobster Pounds". 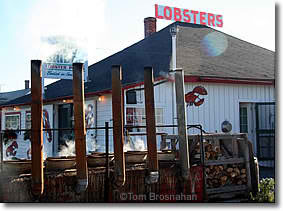 A Lobster Pound is a very simple eating establishment (many times just picnic tables) with big steaming vats outside. Lobsters, clams etc go straight into the steamer and then directly on your plate. A meal is a glorious mess. Everyone needs a bath by the end. So most of us went to the Trenton Bridge Lobster Pound for a lobster dinner. 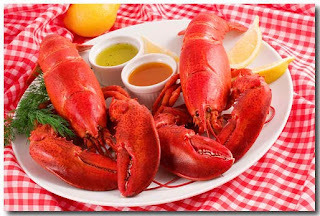 Michelle gave lessons on how to eat a lobster. This caravan is actually about to begin. Our first signup meeting was over a year ago. Departure time has finally arrived. 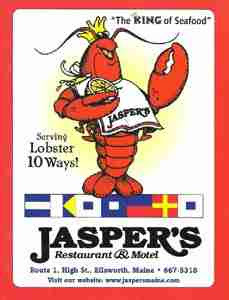 One evening last winter, I saw on TV (probably Discovery Channel) a program about Truck Stops. I was amazed at what has happened to truck stops over the last several years. I never really paid much attention until recently when our RVing adventures put us in much closer contact with truckers and truck stops. 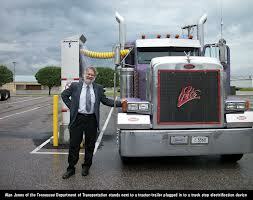 As part of this show, there was a segment on Truck Stop Electrification (TSE). What a neat idea!! Today I saw it for the first time in real life at the West Gardiner Service Plaza on the Maine Turnpike. 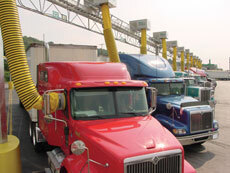 The U.S. Department of Transportation (DOT) estimates there are about 5,000 truck stops in the United States. 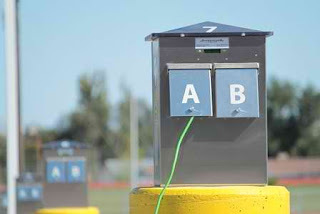 Electrified parking spaces (EPS), also known as truck stop electrification, allow truck drivers to provide power to necessary systems, such as heating, air conditioning, or appliances, without idling the engine. Truck stop electrification can reduce diesel emissions and save on fuel costs, although there are indirect impacts associated with the method of electricity generation. Options for truck stop electrification include single-system electrification and dual-system electrification, also known as "shorepower". In single-system electrification, off-board equipment at the truck stop provides heating, ventilation, and air conditioning (HVAC). 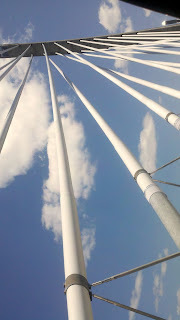 These HVAC systems are contained in a structure above (called a gantry) or on a pedestal beside the truck parking spaces. A hose from the HVAC system is connected to the truck window and, in some cases, to a computer touch screen that enables payment. Dual-system electrification, also known as "shorepower," requires both onboard and offboard equipment so trucks can plug into electrical outlets at the truck stop. To use dual-system electrification, trucks must be equipped with an inverter to convert 120-volt power, electrical equipment, and hardware to plug into the electrical outlet. Necessary electrical equipment might include an electrical HVAC system. Truck stop outlets are owned by the truck stop or by a private company that regulates use and fees. 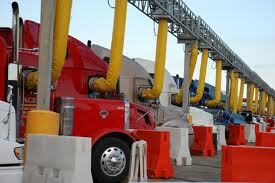 The trucking company or driver owns and maintains the onboard equipment. 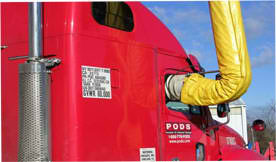 A small but growing network of centers across the country are providing plug-in electricity to truckers who stop there. The service allows truckers to plug in to the electrical grid for a small hourly fee and run electronic devices in their cabs without having to idle their engines. Shorepower Technologies (formerly Shurepower) is currently deploying electrified parking across North America. Shorepower provides Truck Stop Electrification (TSE) as well as Electric Vehicle Supply Equipment (EVSE) for electric vehicles and plug-in hybrid electric vehicles. Shorepower TSE allows truck drivers to turn off their engines and plug into all weather electrical and communication outlets during mandatory rest periods. This reduces fuel costs, toxic exhaust emissions, maintenance costs and provides a better night's rest. As of Feb 2013, Shorepower operates approximately 55 TSE locations in 30 US States. Alan Bates, director of marketing and strategic development for Shorepower, described the service as similar to an "energy vending machine." Truckers can hook up to the Shorepower machines using a heavy-duty electrial extension cord, then run heating and air conditioning systems and use in-cab appliances such as microwaves and TVs on the 110/208-volt system. Cable TV is sometimes included. The service has a hook-up fee of $1 and costs $1 per hour, and truckers have four ways to pay. They can use credit cards over the phone, online or at a kiosk in the truck stop, or they can use cash to buy prepaid cards from the truck stop cashier. For a trucker taking a 10-hour rest stop, the cost would be $11, Bates said. "To idle a main diesel engine for that same period costs about $40, not including maintenance, just for fuel," he said. In addition to the cost savings, the setup is environmentally friendly. The environmental advantage is one of the main reasons Shorepower is offering the systems. It teamed up with another company, Cascade Sierra Solutions, to take advantage of a $20 million grant from the U.S. Department of Energy to install the plug-in stations. Fewer than 20 are operating, but Bates said the goal is to have 65 open by the end of the year. The stations also can be used by RVs and electric cars, although Bates said that is a decision left up to individual truck stop owners. The truck stop gets a small cut of whatever revenue Shorepower brings in at each plug-in station. Truck Stop Electrification (TSE)seems like a real good idea to me I'll keep looking for a driver who will let me spend time in his cab to see this in action.